Filippo Grandi expresses his gratitude to Kenya for hosting almost half a million refugees and keeping its borders open to people fleeing war. "This commitment of Kenya must be matched by the international community." UN High Commissioner for Refugees Filippo Grandi has expressed his gratitude to Kenya for continuing to host almost half a million refugees and keeping its borders open to people fleeing war. In a meeting with President Uhuru Kenyatta, Grandi received assurances that as the Somali refugee repatriation programme progresses, no refugee will be returned against his or her will. The Somali refugee crisis is now entering its 27th year and Grandi said that as long as Somalia remains fragile, many refugees will remain apprehensive about returning home. Nevertheless, he noted that a significant number of refugees are deciding to return. So far this year, over 35,000 refugees from Dadaab refugee camp have moved back to Somalia under UNHCR’s voluntary repatriation programme, while over 18,000 have registered to leave. Since December 2014, over 73,000 refugees from Dadaab have returned voluntarily to Somalia. “These refugees are hopeful, and have made informed choices,” Grandi said, pledging continued support from UNHCR, the UN Refugee Agency in providing them with reintegration assistance upon arrival in Somalia. In Kismayo, Somalia, where most returning refugees from Dadaab have settled, Grandi met families who had lived in refugee camps in Kenya and Djibouti for two decades. Although the families were concerned about security, they expressed joy about shedding their refugee status and determination to contribute to rebuilding their country. UNHCR, together with the American Refugee Committee, is building simple settlements for returnees in greatest need of housing, and providing vocational training to help them find work or create businesses. On a visit to Dadaab on Tuesday, together with Ahmed Hussen, the Canadian Minister for Immigration, Refugees and Citizenship, Grandi spoke to refugees who were trying to decide whether to remain in Dadaab or return home to Somalia. Both Grandi and Hussen visited the repatriation ‘help desk’ where UNHCR carefully verifies the voluntary nature of their decision. While meeting refugees, Grandi appealed for stronger international efforts towards stabilization. “Somalia continues to need international efforts to help rebuild infrastructure and to create security conditions for refugees to return,” he said. During his visit, Grandi heard from Somali refugees about their challenges and hopes for the future. He also met with local authorities and host community leaders. 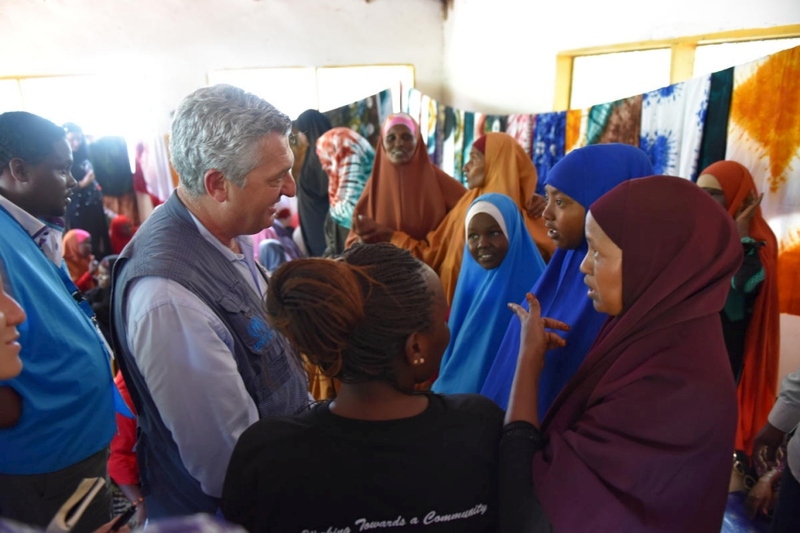 “It’s useful for me to be here to learn and hear from you, even as we continue to do our best to support you,” he said, at a meeting with women and girls who are survivors of sexual and gender-based violence in Dadaab’s Hagadera camp. The women and girls displayed artwork they had been trained to make through a UNHCR-funded programme, managed by the International Rescue Committee, that supports vulnerable women. The women, who receive counselling at the center, expressed gratitude for the support they received but asked for more sewing materials so they could sell their wares, citing a lack of sufficient income-generating activities in the camp. “I can assure you that UNHCR and our partners are doing our best to use the scarce resources available to meet the most basic needs,” Grandi said. He expressed his regret that donor support is diminishing at a time when refugees here still require ongoing aid. Receiving Grandi in her modest shelter with a tin roof and a dirt floor, Ladan, a mother of five, told Grandi that conditions were tough. She was relocated after her section of the camp was closed as people left for Somalia. “I struggle to get enough food for my children as the food we used to receive was reduced by half,” she said, referring to World Food Programme’s ration cuts, a consequence of reduced donor funding. Her woes were echoed by other refugees, including community leaders who met with Grandi and outlined the challenges they face in the camps. The leaders cited high numbers of school dropouts and lack of higher education, decreasing opportunities to be resettled to third countries and lack of specialized services for people with special needs as some of their challenges. Grandi listened carefully to their concerns, particularly the need for more university education scholarships and vocational training. He was inspired by 16 high achieving students whom he met with Minister Hussen and had been awarded university scholarships under the World University Service of Canada, but regretted that hundreds of other successful high school graduates would not have the means to continue their studies. The High Commissioner said he would continue to appeal to international donors on their behalf and work with the government of Kenya in realizing President Kenyatta’s pledge to establish a vocational education center in Dadaab for both refugees and the host community. “Our appeal to donors and hosting countries is not to give up on Somali refugees,” Grandi said, noting that the World Bank had allocated US$100 million in loans in recognition of Kenya as a major refugee hosting country. Much of that investment is planned for infrastructure development and environmental rehabilitation programmes in Dadaab. Grandi called for a departure from a dependency model of enclosed camps like Dadaab. He said he was encouraged that Kenya had signed on to be one of the 13 countries that have adopted UNHCR’s new Comprehensive Refugee Response model.